Cliffs of Moher are located at the south-western edge of The Burren area near Doolin. The cliffs rise 120 m above the Atlantic Ocean at Hag's Head and extend for a distance of eight kilometers and to a height of 214 m. The Cliffs are a significant tourist attraction, and there is a visitor center and parking lot on the site managed by Shannon Heritage, which also operates O'Brien's Tower. A largely unenclosed walking trail runs along the top edge of the entire length of the cliffs, skirting private grazing lands and often running within mere meters of a sheer drop off into the ocean. The Burren is an amazing place. It is a karst limestone region of approximately 300 sq km which lies in the North West corner of Co Clare, in Ireland. It is composed of limestone pavements, which are eroded in a distinctive pattern known as karren. This pavement is crisscrossed by cracks known as grykes and underneath the pavement there are huge caves and rivers that suddenly flood when it rains. It contains dozens of megalithic tombs and Celtic crosses and a ruined Cistercian Abbey from the 12th century, Corcomroe.You can find villages abandoned since famine times and green roads on which you can walk for miles without ever seeing a car. And if you go in springtime you will find rare wildflowers such as gentian and orchids and bloody cranesbill. Dividing Ireland almost in two and dominating the midlands landscape, the River Shannon has acted as a formidable barrier to movement from East to West while providing a marine highway from North to South. It is the longest river in both Ireland and Britain, and has influenced the military, social and economic history of Ireland since the beginning of time. Travelling over 200 miles from its source to the sea, it is home to over a dozen lakes and more then a hundred islands. It is joined on its journey by dozens of smaller rivers and streams some of which are also navigable. 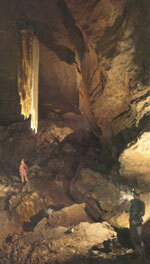 Poll-an-Ionain, near Lisdoonvarna, is a difficult cave to explore and has inside it a huge stalactite nearly 25 feet long - the longest in western Europe. The Clare caves are definitely not for the casual visitor owing to the many narrow water floored passages. Pollnagollum is sited on the east side of Slieve Elva in the townland of Caherbullog and is a wide funnel-shaped hole about a hundred feet deep. A fixed rope enables one to scramble down some seventy feet on to a sloping area covered in ferns and mossy stones. To the left under a cliff is the main shaft which must be descended by rope ladders.